Ever walk into a room and forget why you were headed there? Or you're in the middle of a conversation with someone when dead silence is suddenly all you hear before realizing they asked you a question and you have no idea what it was? Perhaps you ran to the grocery store for one item and you return home with three—none of which were the original item you went for. It is all around us on a daily basis. So many tantalizing items to draw us away from what we were supposed to be doing in the first place. Oh, who am I kidding? 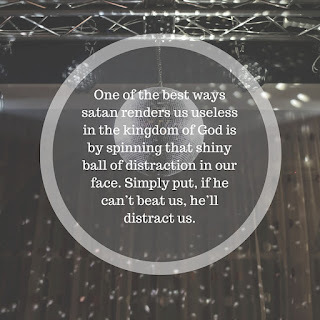 Sometimes they aren’t even tempting, sometimes it’s busyness or boredom that become our distraction. Whatever the reason, distraction pulls us from our intentions to a place where none of them are accomplished. And it’s a tactic the devil uses daily. See, for many of us we know the Truth. We fully believe we are saved, and we have a purpose directly given by God. Satan is unable to goad us into buying the lie that we are anything other than a daughter of the King. But if he can’t pull our eyes from the One who we wrap our identity in, then he is going to attempt the next best thing possible: distracting us from our purpose. 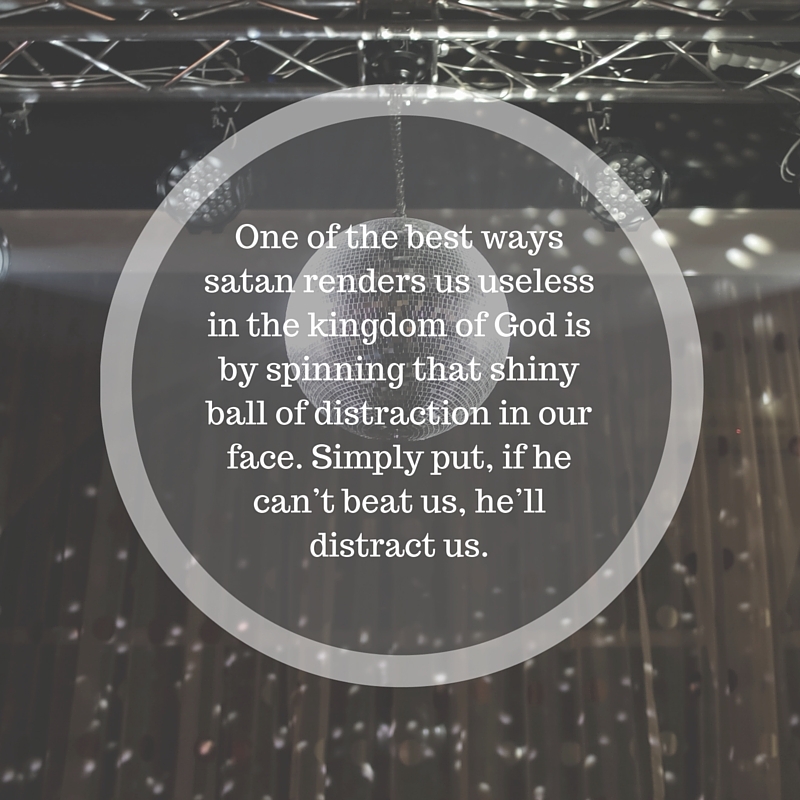 One of the best ways satan renders us useless in the kingdom of God is by spinning that shiny ball of distraction in our face. Simply put, if he can’t beat us, he’ll distract us. So how do we combat this? I mean, some days we don’t even recognize the tactics he employs. Like a pick-pocket, he moves in close with a clever manner that allows us to feel comfortable while keeping our focus on anything but what’s really occurring. In this case it’s our true purpose being stolen from us. The only way to combat this scheme is if we learn to keep our eyes on Jesus all the time and constantly be on guard for the devil’s smooth talk and shimmering diversions. Friends, anything that diverts us from God’s purpose and plan for our lives is dangerous. Stay close to him. Spend time with in his presence every day, chatting and asking about the decisions before you. Just because something looks good—is good—does not mean it’s for you. There are so many wonderful opportunities that come into our lives, yet if they don’t align with what God has for you then it doesn’t matter how good they are, they are still a distraction from God’s best. And don’t let the tactic of distraction pull you from it.